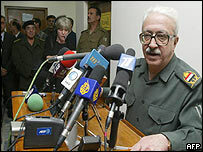 Following are excerpts of the interview the Iraqi Deputy Prime Minister, Tariq Aziz, gave ABCNEWS in Baghdad on 30 March 2003. "This is not a new policy, the people which is being threatened by an invasion has the right to fight by all means to defend itself. This is one of the means to defend Iraq against the invaders. So it is welcome, yes it is welcome. "The Arabs and Muslims are wholeheartedly supporting Iraq and they know that this is an unjust war. "A war of aggression, colonialist, imperialist war against Iraq and against them as well therefore they are ready to join forces with the Iraqi people to fight the invaders and that is very natural. "You know - the question of terrorists, when you fight an invader by whatever means available to you, you are not a terrorist, you are a hero." "They volunteer themselves to come to Iraq and we welcome them. "But the Iraqis are doing it also, the first one who did it was an Iraqi. He was not a foreigner. There will be others. Iraqis, Arabs, maybe Muslims, yes. We welcome them." "We have no connection with Osama Bin Laden and those people [foreign fighters] are not connected with Osama Bin Laden. "They are just people who see that what is happening is unjust this is an imperialist invasion of a Muslim and Arab country and they wholeheartedly support Iraq." "The war is going very well as far as we see it and as far as the realities are. "I tell you that this war was based on bluff and based on... wrong calculations based on lies and deceptions by the Americans and the British. "They are surprised that the Iraqi people are resisting them courageously with a great determination to deter them... The Iraqis are going to receive the invaders with bullets. "I'm really astonished to the degree of shallowness in which the American and British military and political leadership are dealing with the course of the war. "They are making cheap lies, which are unbelievable and they are betting on imaginary things which do not exist." "Victory, victory, I tell you one thing, you have to be specific when you speak about victory in this conflict. "The victory for Iraq is that they deter the invasion. When we succeed in crushing the invasion and when we compel the invaders to leave our country, that is the victory, the victory because we're not fighting the Americans and the British on open land, you see. "When we succeed in deterring them, when we succeed in inflicting too many losses on them, and in the end they will find themselves obliged to stop and withdraw. That's a great victory." "We can end this war when the invaders withdraw totally and unconditionally from the Iraqi territory. Nothing less. "We're not going to beg for a ceasefire as long as there's one soldier in our territory. Ceasefire - OK, end of war - OK, but with complete unconditional withdrawal and with decision to leave. "This war could be ended easily when they stop and withdraw completely and be accountable for crimes they did against Iraqi people. That will be the end of the war." "Saddam Hussein is seen by the people who should see him. The leadership and those who are fighting the enemy. Saddam Hussein is the president. I was with him yesterday, we appeared on television. "But he is not going to go to places where he could be attacked by the Americans and the British, he is intelligent enough to know that this is one of the traps which are being made to catch a leader. "Saddam Hussein is an experienced commander in chief, he was a leader of Iraq and leader of the Iraqi armed air force during eight years of war with Iran. When he was personally targeted by the Iranians and he was also targeted in 1991 so he knows how to behave." "They say that. He was not in that place, he was not in that place. They are bluffing... make some deceptions in order to discourage the enemy for grander reasons, for psychological reasons. "But what is happening now, and I tell you, I don't want to be rude - when I listen to what they say I laugh. "What they are trying to sell to the American public opinion and to the international community is unbelievable. It's cheap lies. Shallow lies, you see."